The Tenjo Line is the uppermost section of a keiryu or ayu fishing line. It can serve several purposes, but I generally use a Tenjo for visibility and to reduce tangles. Thus, I choose a hi-vis line that is a bit thicker than the rest of the keiryu line. The main benefit of the hi-vis is that it is easy to see and it effectively points to your markers, making them easier to spot at the very beginning of your drift. The main benefit of having a slightly thicker line is that it reduces the chances of tangles at the rod tip. Some tenjo lines are constructed in a way that makes them adjustable for length. Although that may be a nice feature, they are hard to make without specialized (and expensive!) equipment. I have found that it is not too cumbersome to just switch lines if you need one that is a bit shorter or longer. That is one of the benefits of the Daiwa Tankei 1500SK keiryu line holders. The container holds 10 small winders, so you can have several tenjo lines and main lines (already cut and tippet rings attached) making it easily to switch lines if necessary. I have tried several things for a tenjo line, including size 2.5 Oni tenkara line and various brightly colored nylon spinning lines, and have settled on the Sunline fluorocarbon tenjo line.The line I have now is size 1.25, which is substantially thinner and lighter than the size 2.5 Oni line. 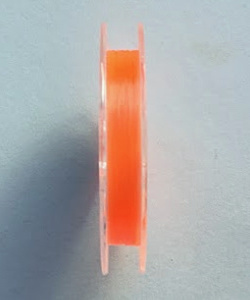 It is also extremely visible bright fluorescent orange. The size 1.25 line is thin enough to use with a girth hitch, which will require that you tie a knot in the end of your lillian. It is not so thin that you cannot use a standard tenkara slip knot attachment, but if you go that route, I would highly recommend doubling the line when you tie the figure 8 knot in the tag end (which provides something to hold onto when removing the tenjo line). Clip the tag end and small loop formed when tying the double figure 8, leaving only the bulky knot itself. See the Rod Care page for the figure 8 knot (not doubled) and slip knot attachment method. 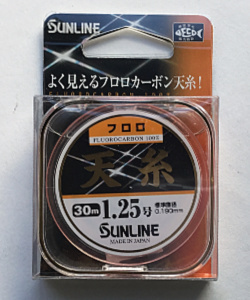 The Sunline Tenjo line is a bit more expensive than a spool of spinning line, but you only use 4' to 6' feet at a time, so one spool will last for a long, long time. I use roughly 6' on a 6+m keiryu rod, 4' on a 5+m rod and 3' on a 4.5m rod. Tie a tippet ring to the end of the tenjo line, and tie your main line (fluorocarbon tippet ranging from 7X to 4X) to the tippet ring. Tie a tippet ring to the end of your main line and tie a foot of lighter tippet (9X to 5X) to that ring. Tie your hook to that lighter tippet. The split shot goes on the lightest tippet and the keiryu markers go on the main line. Total line length, rod tip to hook, is a matter of personal preference, but I like the length to be a bit shorter than the rod length. Keiryu anglers in Japan do not use tippet rings, but the attachments they do use require loop knots, which are weaker than the Double Davy knot I use for tippet rings. Weaker knots are not a problem if you catch 9" fish. They can be a problem if you catch 19" fish on light tippets. I switched from the nylon tenjo line to a fluorocarbon line for one reason: I think the very soft Nissin Fine Mode Nagare 330 and the shorter Nissin Air Stage Hakubai (medium) rods may be able to cast it. That would make it the lightest "tenkara line" that you could find. The bright orange should even make it visible, as long as you are fishing a relatively short line in relatively good light.